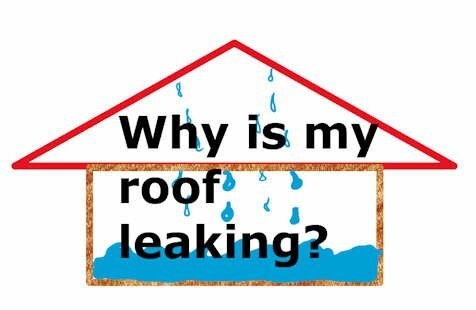 Leaking roofs are as common as the number of rainy days in Sydney. We have spend many years repairing leaking roofs in Sydney and we have a decent database containing the causes of roof leaks. Most roof leaks fall into the categories below. If your roof is leaking, then you will quite likely be able to find out the causes on this post. There are always exceptions to the rule and some roof leaks are quite hard to track down and this is where we can be the most use to you. The uncategorised roof leaks will stretch our knowledge base and I come across these from time to time. Sometimes, I feel like throwing up my hands and giving up. …..But the challenge of finding the cause(s) of a leak and fixing it is always met with dogged determination. As soon as holes are cut on a roof to put skylights in, the natural waterproof nature of roofs are violated. Some skylight installations leak the day they are cut into a roof. This is usually the result of a poor selection of skylights or a faulty installation. Then during its life, leaf blockage is the usual reason for skylight leaks. Finally, the life of a skylight is usually less than the roof – so old rusty skylights leak and will need replacement. I have a FAQ page dedicated to leaking skylights … <so pop over there if you think your skylight is the problem. Roof tiles do not often break by themselves. If you have overhanging trees, falling branches will break tiles. As soon as you let people walk on your tile roof, there is a danger of broken tiles. Children like throwing things and these things can break fragile roof tiles. The worst I have seen is freshly broken roof tiles caused by another roofer (doing a roof inspection and quote) and just left there. We always carry spare roof tiles around with us and replace any that we break during roof inspections… but it clearly seems that other roofers do not bother. A break on a roof tile can be quite difficult to trace if it is on the water (drainage) course. I have a post about these tricky leaks caused by broken water courses. 3) Rusty or blocked valleys: While tile roofs do not rust, there are valleys on most roofs and in the old days, they just used galvanised metal valleys. These have a 20 to 30 years life … so rusted valleys are quite common on Sydney roofs. I have a page dedicated to roof valleys.. < so pop over there if you have a valley problem. 4) Faulty tile ridge capping: The bedding and pointing under tile ridge capping crack over time. Water seeps into the cracks and does three things. …It can pool behind the bedding (if it is sealed to the roof tile) on the roof tile and eventually overflow into the roof cavity (this is why weep holes are essential). …It can run along the back of the bedding, find a drainage path along the tile and seep out again – with out causing any harm (the usually case). …Or it can run along the back of the bedding and NOT find a release drainage path, but the edge of the roof tile. The result is a leak. These leaks are hard to spot without removing the ridge capping first. If you want to find out more about weep holes and ridge capping repair work < go to my dedicated pages on this subject. 5) Chimneys: A chimney is another hole on the roof that needs to be waterproofed correctly. The flashings around chimneys deteriorate and often cause leaks. Chimney pots break. Most tile roofs have lead soaker flashings on the upstream side and the lead will crack after a while. A simple fix is to reseal with silicone sealant. The expensive alternative is to replace the flashing with a new one. Some chimneys have hidden soaker flashings along the side and these can also rust out. 6) Faulty flashings: The edges of roofs have to be waterproofed by flashings. It takes a lot of roofing experience to be able to detail complicated roof flashings so that they look good and do not leak. If a new roof leaks, then the roofer usually has made a mistake on the roof flashing. We can usually gauge the quality of the roof installation by how the flashings are finished off. 7) Rusty roofs: This reason may seem quite obvious. It is easy to see if a roof is rusty. But it takes a while between when a roof begins to rust and when holes form and water starts dripping. Also, often, the rusty areas are very localised and hidden. In these instances, only close inspection will reveal the rust spots at laps and under flashings. 8) Blocked gutters: I am adding this to my original 7. Blocked box gutters can cause havoc if there are no overflows to act as a relief valve system. If you experience flooding inside your house and you have a box gutter – then it is quite likely a blocked outlet in your box gutter. The temporary solution is simple – just clear off the blockage. Long term, a system to prevent the blockage and overflow protection is needed. Normal Eaves gutters are often left full of leaves and this will start a nice garden in the gutter as well as overflowing gutters. They do not normally cause problems with leaks into the house. The exception is when the eaves extend over windows. Overflowing water will run along the eaves and fall onto the head of the window – causing a cascade of water along the inside of the window. It has been a busy year for us for doing lots of roof repairs and colorbond roof replacements. My guys are now on a well earned Christmas break and we are not due back until January 13th 2014. I will be in Adelaide and doing no roof work at all. So, if you will be submitting a roofing quote request during this Christmas holiday period, please be patient and I will get back to you mid January 2014. We have had long dry period and also long wets. There was a period when it rained continuously for more than a week. That meant lots of leaking roofs needing repairs and looking back over the jobs that we have done, the majority have been roof repairs due to a variety of reasons. In particular, leaking Velux skylights have been quite challenging. Rusty box gutters cause a lot of damage to the internals of the house when they decide to leak .. It is quite common for the box gutters to give up well before the roof – so it is wise to use colorbond box gutters with adequate falls to prevent expensive box gutter replacements. Kliplok roofs are quite easy to lay – but the challenge is to do the flashings correctly (including turning up and turning down the sheets). Rusty valleys on metal and tiled roofs can cause a lot of water ingress, Including bad detailing ..
We have pulled out lots of rusty valleys and swapped them with colorbond valleys this year. Swiss terracotta roof tiles are my pet hate, and this year we have had plenty of them..
Swiss tiles are so bad that manufacturers don’t make them any more… but I still have to fix leaking old swiss tiled roofs! Instead of pulling tiles off and replacing the traditional soaker flashing along the parapet walls, we have usually gone with the option of providing a new ‘Wakaflex’ flashing with a colorbond ‘pressure seal’ to give the parapets a cleaner look. Our other specialty is putting up colorbond metal roofs. And we have done plenty of these this year also. There are a lot of metal skillion roofs in Sydney. Especially in the inner west and outer western areas where we work. And we do a lot of these every year. Changing tile roofs to colorbond metal roofs are quite fashionable now and the following pictures show why this is so. See you in the new year………………. Colorbond vs tile roofs in Sydney. Which one is better?